DuroMax XP10000E is the type of gas powered portable generator that most people rely on for backup power. As the unit’s name implies, the generator is wheeled and put to use whenever power is needed in the absence of electricity. This unit typically runs on gas. By far the most common gen-set used in off-grid systems is DuroMax XP10000E. This powerful gen-set runs on a 16hp air-cooled OHV engine that has the capacity to produce 8,000 watts of power, along with a peak of 10,000 watts. 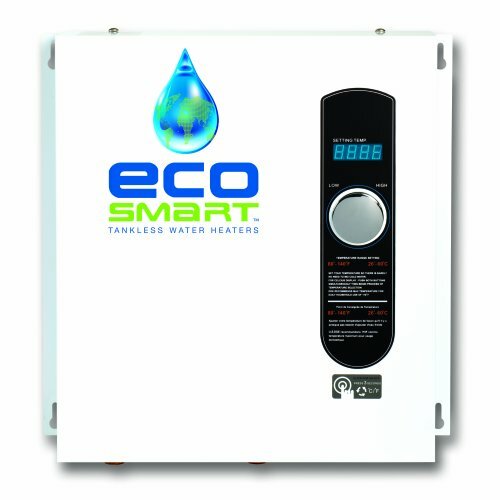 The unit is well designed, consisting of a standard recoil start in addition to an easy electric start. The unit is a conclusive presentation of the next generation gas powered portable generators. DuroMax XP10000E has the capacity of running a constant 8,000 watts in addition to a maximum surge output of 10,000watts. This is the best power gear to employ on construction sites as well as large houses, due to its high operating voltage. It features a uniquely powerful 16hp air-cooled OHV engine, which is known to operate at convenient sound level of seventy two decibels. The generator’s ability to operate quietly is further advanced by the presence of four isolated motor mounts and the super quiet muffler. The unit has a conveniently large fuel tank volume of 8.3 gallons, allowing it to operate at a run time of ten hours per tank at half load. The unit is integrated with a low-oil shutdown mechanism that enables the gen-set to go off the moment the minimal oil mark is reached; therefore, protecting the engine from frying up. XP10000E is incorporated with overload protection mechanism, consisting of a dual amplifier circuit breaker. The unit can be used conveniently for residential reasons as well as commercial reason. For residential uses, it consists of 2 120V, 20A outlets; while for commercial uses, it consists of 1 120/240V, 30A twist lock outlet. In addition, it constitutes 1 120/240V, 50A outlet designed particularly for heavy duty equipment. It is incorporated with two different starting systems, including standard recoil start along with easy electric start. XP10000E pneumatic wheels along with its flip-up handle makes it easy to position the generator as per your needs. DuroMax XP10000E is not CARB compliant; however, as far as certifications and listings are concerned it is 1_UL Listed, CSA Listed. Has a continuous wattage of 8,000 watts and peak wattage of 10,000 watts. It engine is defined by the following: horse power of 16, engine displacement of 420, OEM branded, and air-cooled OHV model. The unit’s dimensions are 40 by 29 by 27.5 inches, and its weight is 129 pounds making it compact and fairly light to handle. It is integrated with both recoil and electric start mechanisms. The generator is incorporated with a fuel gauge, uses gasoline, has a fuel tank capacity of 8.3 gallons, and a full load fuel consumption of 0.6 gallons per hour. It constitutes a low-oil shutdown system and a super quiet muffler, along with an operation noise level of seventy two decibels. It consists of the following outlets: 2 120V, 20A outlets; 1 120/240V, 30A twist lock outlet; and 1 120/240V, 50A outlet; 120/240V, 30A twist lock; and 12V, 10A utility. The generator is worth the money; given the fact that it has a large fuel tank capacity of 8.3 gallons, allowing it to run for ten hour per tank at half load. XP10000E can be used both locally and commercially; therefore, the user experiences full capabilities of the gen-set. It operates at conveniently low noise level of 72dB, which hardly may interfere with you activities while it is operational. Not CARB compliant; consequently, California people cannot purchase the unit. DuroMax XP10000E is the most recommended power gear for both residential and commercial uses. You should buy this generator if you are living in disaster prone areas; such as areas prone to hurricanes. The unit is convenient if you have a large home with a large number of electrical appliances. Ideally, XP10000E will provide additional power to operate high amperage appliances that other portable generators cannot possibly manage. This rugged power machine is what you need for your jobsite for powering drills, saws among other critical high amperage equipment. 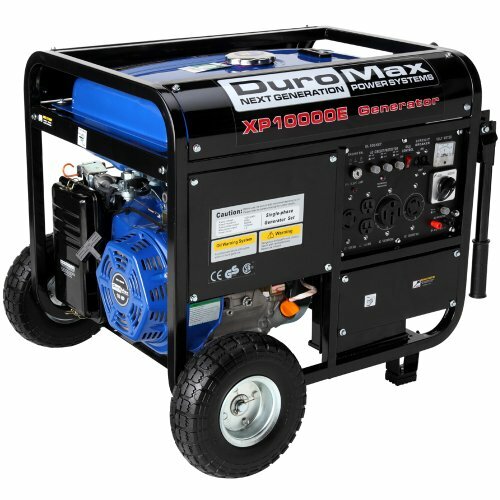 DuroMax XP10000E is a top rated gas powered portable generator in the market. Its reputation is well known as far as its residential and commercial uses are concerned. Characteristically, XP10000E is unique given its ability to run heavy duty power appliances. The power produced by this unit has proven to be highly effective, due to its 16hp, 196cc, air-cooled OHV engine. The generator has hardly presented any issues with the users who have bought it. Therefore, you are strongly advised to invest your money on this power gear, and forget all possible power outage that may arise due to bad weather. Moreover, this is a good piece of art to bring along when out camping; given the fact that it is relatively light and easy to position due to its fully packed wheel kit and flip-up handle.